Camcorders are a great accessory to have when trying to capture life’s important moments. With today’s technology, many camcorders possess the qualities needed to make high-quality videos, whether they be for business or for pleasure. With so many options available, it can be hard to decide which model is best for you. This guide was created with the consumer in mind, hoping to make the process of buying easy and convenient! Full-size: Full-size camcorders can have up to 50x optical zoom – meaning that even if you are at a far distance from the subject, you will still be able to capture it with the camcorder. The majority of these models have an HDMI output in their hardware. This means you can hook up your camcorder directly to your TV and watch your videos on the large screen! Action cams: Action cams are designed for people who are active outdoors and want to document their journeys. These are great for people who like to hike, bike, surf, snowboard, etc. Action cams are very compact in size and weight, making them convenient to pack and carry with you. Many of these camcorders contain waterproof extremities or mounting brackets to attach to various surfaces to make videotaping easier. However, they lose some of their LCD capabilities which other, larger camcorders have because of their compactness. Image stabilizer – This feature allows the camcorder to automatically reduce the amount of shaking coming from external sources while you hold it to shoot images and videos. Full-auto switch – With this feature, the camcorder automatically adjusts the color balance, shutter, speed, and focus. This allows for faster shooting and better quality images with less work from you. 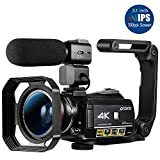 Autofocus – This refers to the camcorders ability to generate pictures with maximum sharpness, which can be very helpful when recording in conditions with less than optimal features, such as in areas with low light. 3D capability – This allows the camcorder to capture images, videos, or both, in 3D. Viewfinder – Mostly available in camcorders in the higher price ranges, this feature allows you to take a shot without requiring the full display. This can help save battery, and is also very useful in areas of bright light. 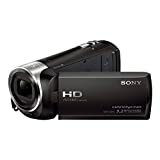 Easy of use: Many reviewers emphasized the importance of how easy to use their best camcorders were. 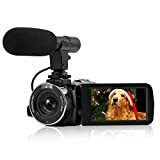 Whether you are a professional or are picking up a camcorder for the first time, the model should be intuitive to use and be able to produce a video of good quality. This includes the function controls as well as the buttons needed to work the camcorder itself. Clarity of footage: There are many factors that will determine how sharp and clear your footage comes out. Many reviews stated that if you are going to have extra features, an image stabilizer is definitely a must. This will help to reduce shaking from your hands, especially at higher zoom levels. Memory: Many camcorders come with a decent amount of memory available to store information, but this can run out quickly, especially if you are used to storing videos and images solely on your camcorder. Think about getting a memory card, and make sure it is compatible with your camcorder. Size: If you want a camcorder that produces high-quality images and has a lot of options, opt for a full-size model. If you are going to be using your camcorder during outdoor adventures, an action cam is your best bet. Control and Functions: Too many buttons and functions can result in frustration, and can also be irrelevant if they are not going to be adding to your camcorder recording experience. Pay attention to the features the model has and think about if you will really need all of them. 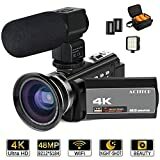 Accessories: Are there any accessories you will need to go with the camcorder? For instance, if you are buying an action cam to tape your bike rides, check and make sure that the camcorder is able to be hands-free and/or mounted. Canon: Canon was founded in 1937 by Fujio Mitarai. 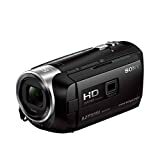 It designs and creates high-quality camcorders for both consumers and professionals at affordable prices. They are a brand that is featured in hundreds of stores worldwide. Samsung: Samsung has been a leader in the market of technology for over 70 years. It designs and manufacture many innovative products, including their high-quality camcorders. 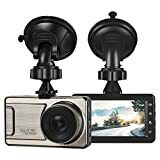 Their products are renowned for offering high-zoom and pixel video recording and also provide users the convenience of uploading their videos straight to YouTube. BeachCamera: Located in New Jersey, this consumer electronics retailer has been offering new digital products since it first was established in the 1990s. BeachCamera has won the Bizrate Circle of Excellence Award six times for its electronics. Vivitar: Vivitair carries a wide range of great camcorders including waterproof models, 3D- capable models, and also models that utilize Wi-Fi.